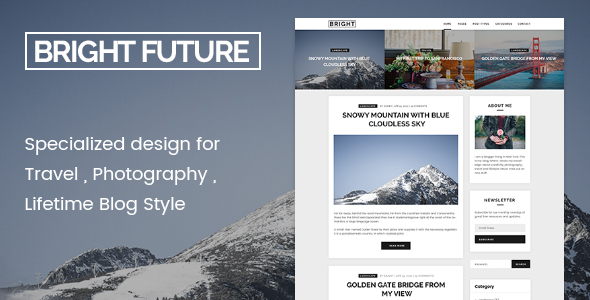 Bright is Clean Blog WordPress theme for marketer which have many useful features to allow you build a creative,personal,branding, marketing , seo blogs in a few minutes! was designed by our talents and passion, we take care any details to make it look perfect. A Fast loading website bring more business : Donâ€™t let your customers wait so long or they will go to another site. Fast loading is also a key for seo right now. Fully Responsive and Mobile Friendly : Mobile Friendly is now very important. Mobile Friendly makes visitors easy to read your site and they will keep coming back. Itâ€™s also an important factor for SEO since Googleâ€™s last update. Built-in SEO compatibility : Best seo practice to help your site get high ranking in search engines such as Google, Bing, Yahooâ€¦ Itâ€™s also compatible with Yoast or All in One SEO plugin. Button Shortcodes with 3 sizes , included all Icon Fonts. About page : Tell the world who you are,what you do and why people should follow you. Archive Page : List most of your useful posts to follow your content strategy. – Advance Theme Options : Customizing the theme with a few clicks. It does not require any coding-skills. Uploading Logo and Retina Logo easily. Uploading the footer logo and retina footer logo easily. 8 predefined sidebars and unlimited sidebars for pages. 12 predefined color schemes and unlimited color schemes to fit any brands! – Fully responsive and retina display ready. – Built based on own new framework which is fast , easy to update and easy to develop! – Translation Ready with .po/.mo files included. You can easily translate this theme to your language. – Demo.xml file included, setting up live demo in just a few minutes. – Outstading Support : Have any question? Feel free to send us a message or leave us a comment. Weâ€™re pleasure to help you anything!